Certainly, the cliché of the old male retiree who spends his time chipping away on hole 14 at the club still exists. If your only association with golf came from what you watched on national television, you would get the impression that only men played (though to be fair, all women’s sports receive little to no television exposure). But the truth of the matter is that over the past few decades, women have been hitting the links in increasing numbers. Dynamic players such as Michelle Wie, Annika Sorenstam and Cristie Kerr have influenced many women across the country to pick up a driver. Sportswear companies are for the first time ever producing women’s golf shoes in mass even. What the women who are new to the game have discovered in the past years, however, is something men have known all along: Golf is not as easy as it looks. There’s a learning curve to be sure, and it can a long, long time before you reach the level of just being adequate. Thankfully, there are a bevy of instructional books that can be phenomenally helpful towards improving your golf game. And many of these books have been marketed specifically to women. Here are a few of the best. 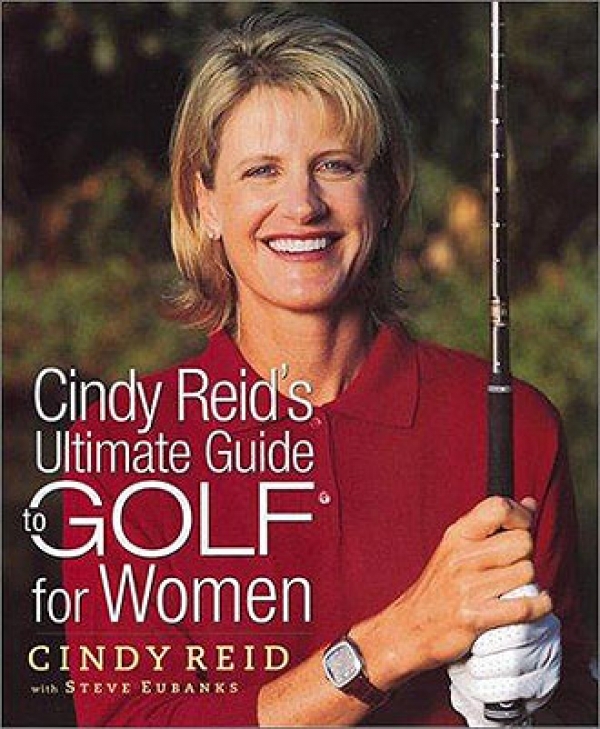 “Cindy Reid’s Ultimate Guide to Golf for Women,” is an industry standard if one exists. The book, written by Cindy Reid coincidentally enough, is a fun and fact-filled digest that is designed to help give novice women a better understanding of the game. Reid didn’t start golfing until her twenties, but she became so fiercely dedicated that she now currently works as the director of instruction at the Tournament Players Club at Sawgrass. Her insight is entirely valuable. Not only does her book provide excellent tips on how to improve technique, but Reid also delves into game’s gender dilemmas, and provides readers with interesting anecdotes that will help women know how to behave in a situation when a man is trying to hurry her up. Another wonderful book for women looking to become more acquainted with golf is “A Girl’s On-Course Survival Guide to Golf,” written by Christina Ricci (no, not the “Casper” actress). This book is as hilarious as it is helpful. 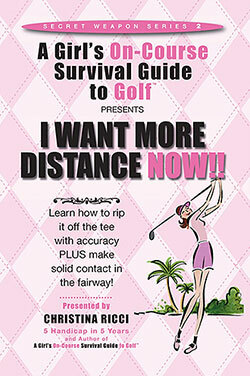 Unlike Reid’s titanic book, Ricci’s book is succinct and portable, and can easily be carried in any woman’s golf bag. Did you forget some of those wonderful tips about how to escape the bunker? Don’t use your photographic memory, you have the book with you! This book is filled with wonderful photos and simple instructions that will help golfers improve their confidence, their technique, and their golf etiquette. For women who are still having trouble on the course and are looking to deflect humiliation, Ricci even provides numerous witty jokes that will do the trick. Like I said earlier, golf has long been something of a man’s game. That’s why most instructional videos and manuals are made with the male perspective in mind, even though the swing for men and women is different. 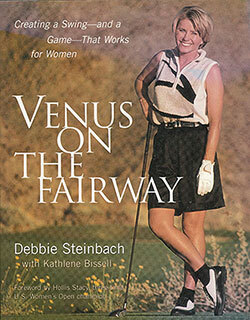 Debbie Steinbach’s “Venus on the Fairway,” is one of the premier instructional books strictly for women. The book contains simple step-by-step instructions and useful visual keys that will help beginning golfers extraordinarily. Steinbach’s book is filled with positive reinforcements and language that that you don’t have to be a golf aficionado to understand. Steinbach has been golfing with men her entire life, and has several useful tips for women looking to compete with the men. There are many more books for women that help to provide a better understanding of the game of golf, but these three are widely known as the cream of the crop. Surveys show that while men golf because they like the competition, women use it as a tool to build and maintain relationships. It is a great game for it. There’s very little more refreshing than spending hours in the sun and on the green with the people closest to you. But just because you’re there for your friends, it doesn’t mean you can’t play to win as well. Dana Bryce is an online publisher who enjoys writing about golf and travel. She currently blogs for Thousand Hills Golf Resort in Branson, MO.